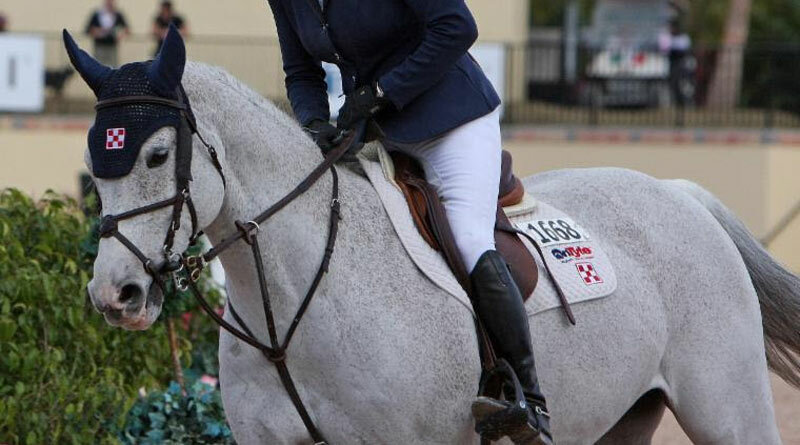 Laura Kraut and Cedric, pictured winning the 2015 $125,000 Trump Invitational Grand Prix at Mar-a-Lago in Palm Beach, Florida. US Olympic showjumper Cedric has been retired from competition and will be officially farewelled on Friday, just before the 4* Nations Cup at the Winter Equestrian Festival in Wellington, Florida. Ridden by Laura Kraut and owned by Margaret Duprey of Cherry Knoll Farm, the 19-year-old Holsteiner gelding (Chambertin 3 x Cortina, by Carolus LL) was the “horse of a lifetime” for his rider. Kraut and Cedric were one of the most dynamic and successful show jumping combinations in US history. Cedric made his FEI debut in 2006 as an eight-year- old, and his partnership with Kraut has been nothing short of incredible. Kraut and Cedric were key members of the United States show jumping team that claimed the gold medal in 2008 at the summer Olympics in Beijing. The pair made numerous Nations Cup appearances around the world, including Rotterdam, La Baule, Rome, St. Gallen, Aachen, Wellington, Dublin and Barcelona on multiple occasions. Kraut and Cedric have also been successful players on the Global Champions Tour and to date are the only horse and rider combination to win back-to-back Global Champions Tour events, winning in Chantilly, France, and then just two weeks later at Valkenswaard, the Netherlands. Cedric, one of the nation’s leading money winners, amassed well over $2 million in prize money and, in major competitions of $100,000 or more, produced 81 clear and 45 double-clear rounds. In 2010, Cedric was named The Chronicle of the Horse‘s Show Jumping Horse of the Year. Throughout her career Kraut has achieved great success with many different horses, yet none of those were more exciting than the partnership she developed with Cedric. He has been a world-class competitor and representative of the United States Equestrian Team. US chef d’équipe George Morris coached Kraut and Cedric to a team gold medal at the 2008 Beijing Olympics. Morris was a huge supporter of the pair from the start, and was confident in their abilities to rise to the occasion in Beijing for Team USA. “I wanted to go with [Cedric] because he was a careful and competitive horse,” said Morris, regarding selecting Cedric for the 2008 Olympic Games. “I never underestimate a little horse, and the rider – nobody rides better than Laura. He is an absolute blood horse. With all of that Thoroughbred blood in his veins, there is no bottom to Cedric. Careful, clever as a cat, so handy, so fast – all of the qualities that really make a superb show jumper. Before going into the ownership of Cherry Knoll Farm in 2012, Cedric was owned by Happy Hill Farm and Peter Wetherill, one of Duprey’s childhood friends. In addition to owning Cedric, Duprey, a Grand Prix dressage rider and philanthropist, also owns decorated grand prix show jumper Constable and Rio Paralympic mount Schroeter’s Romani ridden by Rebecca Hart. Duprey is also a partner in a syndication for Andretti S, who is ridden by Kraut. “I thought owning Cedric would be a great opportunity to become involved in the jumping world with one of the best,” Duprey said about her decision to buy the grey gelding in 2012. “To be able to carry on Peter’s love of this horse and his love of Laura, makes it very special.